With Growing Investments, China's Influence In Autos Is Expanding : Parallels For the first time on a mass scale, a car built in China will be on sale in the U.S., joining countless other Chinese-made products. It comes as Chinese firms invest billions in the auto industry. 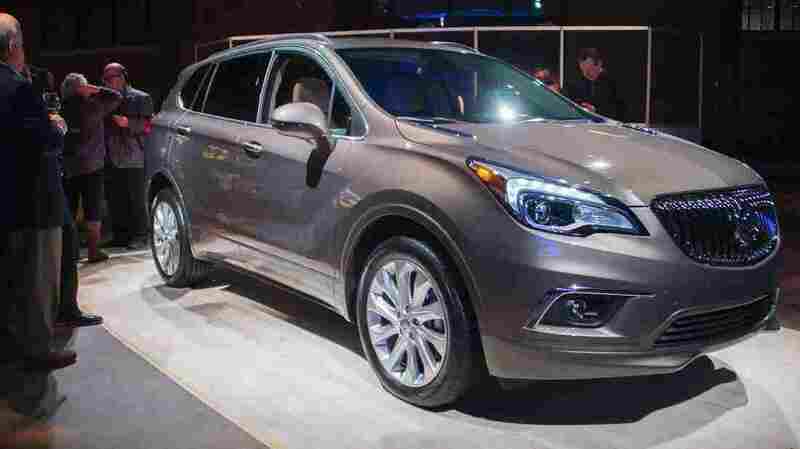 The Buick Envision, built in China, was on display at the North American International Auto Show in Detroit. 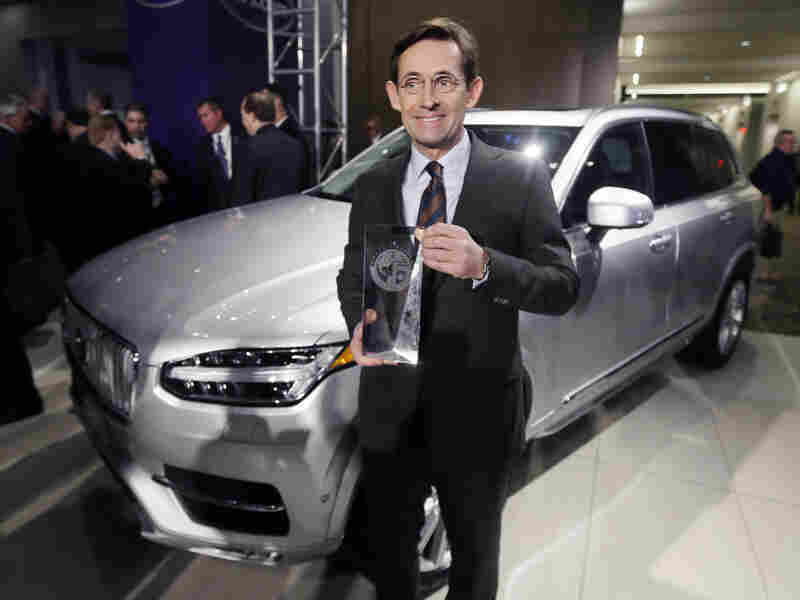 It will soon go on sale in the U.S.
Lex Kerssemakers, CEO of Volvo North America, stands next to the Volvo XC90 after the model was named the truck/utility of the year at the North American International Auto Show, Jan. 11 in Detroit. You can see those words stamped on countless consumer products — electronics, clothes, but not cars. For the first time on a mass scale, a car built in China will be on sale in the United States — the Buick Envision. China is the largest car market in the world. Chinese shoppers easily buy twice as many cars as Americans do. Chinese companies have been investing billions in the auto industry. The latest example is Volvo — the Swedish carmaker known for its boxy, safe, brazenly unstylish vehicles is pride of the Swedish car industry. The Chinese conglomerate Geely bought Volvo from Ford in 2010 for about $2 billion. Volvo went through a restructuring and spent $11 billion to invest in new cars and trucks. "Under the ownership of the Chinese, we have been able to execute all the plans we have developed, after they bought us," says Lex Kerssemakers, the CEO of Volvo North America. "And they gave us a lot of freedom, and I think we have used that freedom very well." Part of that freedom allows Volvo to remain, in direction and culture, a Swedish company. Kerssemakers, who's worked for the company under Swedish, U.S. and now Chinese ownership, says Chinese participation in the auto business is a natural evolution of the growth of the Chinese economy and its role on the world stage. "I see it as an opportunity — it's not a threat," he says. "They're starting to play a role in the automotive industry and I see it as quite natural given what's happening in China." If Volvo represents Chinese investment in Europe and the U.S., then General Motors represents American investment in China. Its Buick brand has had a foothold in China. For luxury carmakers, China is increasingly important. "We've historically been very U.S. centric, but luxury brands are global today," says Johan De Nysschen, head of Buick's sister brand, Cadillac. De Nysschen says China is central to Cadillac's growth strategy. One of the criticisms of the Chinese market is the sheer amount of red tape. "You have to understand that in China, you do business in a joint venture. Which means that whatever profitability you have, you by implication share with a partner," De Nysschen says. He says that in itself means that "you have a significant economic hurdle to overcome before manufacturing in China for global exports becomes more economically beneficial than, say, manufacturing in the U.S."
The next step in the evolving relationship: a Chinese carmaker building its own cars in America. The closest so far is a startup based in California called Faraday, which has Chinese roots and wants to build electric cars. Meanwhile, Rebecca Lindland with KBB.com says car makers can't afford to ignore Chinese consumers because of "the sheer volume that China pulls in — it helps you justify investments in new products, in new technologies, in vehicles that wouldn't necessarily sell in volume here in the States — that you can easily sell them in both here and China." Lindland says China's current economic worries aside, the country's importance to the industry while huge now, will only grow. "It's not growing as fast," she says. "And they certainly have to get things like the stock market figured out." There is still a tremendous amount of demand, especially for luxury cars in China. "They like their well-equipped vehicles. There's lot of profit to be made there," Lindland says. Analysts say Chines-built cars in the U.S. are only a matter of time, but right now China has a big impact on the cars we're already driving.